Introducing Topic Flowers - artificial flowers generated from text. Just give it a try - type or paste in some text and press the 'Create' button. You may have to wait 10-60 seconds for the image to appear. You may also have to click once to activate the application before you can type text or click on the button. Below the application are some guidelines for interpreting the flowers. The same text will always generate the same flower. More text will generate	more layers of petals. 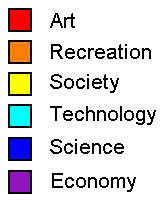 The primary topic will be shown using the associated colour	on the outermost two layers of petals. If there is a secondary topic it will be shown on the third layer of petals. This pattern repeats, two layers using the primary, then one with the secondary. If there exists a tertiary topic its' colour is used to accent the edges of some of the primary coloured petals. The number of little 'hairs' on the flower is indicative of the number of personal pronouns	used in the text. Rounder petal shapes are suggestive of emotionally positive terms (love, yes, peace) , and more elongated terms indicate negative terms (death, murder, idiot).